An important aim of the Society is to encourage binders to improve their skills and to disseminate their expertise to fellow binders or would-be binders. To further this aim the Society runs two educational programmes. In even years there is a SEMINAR and in odd years the NATIONAL CONFERENCE. 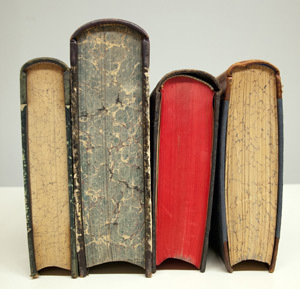 The biennial international Conference is well established as the Society of Bookbinders’ main event, often including speakers from other countries and delegates from around the world. There is a wide choice of lectures and demonstrations, which may be on history, design, conservation or related matters. It runs from a Thursday afternoon and ends with a formal Conference Dinner on the Saturday evening, followed by an auction of items donated by delegates and speakers. It is also the showcase for the entries to the international Competition, and these are on display throughout the Conference. Delegates may also visit an extensive trade fair. The Seminar is a smaller event with the emphasis on techniques and processes used in bookbinding. All lectures are repeated, so that delegates can see everything; there is no formal dinner on the Saturday so everyone leaves on that afternoon. The trade fair is smaller, being mainly UK suppliers, and there is an auction on the Friday evening. In 2019 the CONFERENCE is at the University of Bath. Further details may be found by clicking the Conference button. The next seminar will be in 2020.